The NBC News crew including chief medical correspondent Nancy Snyderman that worked with Mukpo are placed in mandatory isolation in New Jersey after a 21-day voluntary isolation agreement was breached. The state Health Department says the crew remains symptom-free and there is no reason for concern of exposure to the virus to the community. It doesn’t give details on the breach of the voluntary agreement. Journalists are no longer allowed to enter ETUs. These journalists enter the ETUs and cross red lines. They violate people’s privacy, take pictures that they will sell to international institutions. We are putting an end to that. It takes a certain amount of reverse engineering to get the plan to where it can respond to new, emerging threats. We’re trying to rebrand the A.F.L. as a force for good. Piggyback on this. Both of those procedures may spread contaminated materials and are considered high-risk procedures… When you have potentially soiled or contaminated gloves or masks or other things, to remove those without any risk of any contaminated material … touching you and being then on your clothes or face or skin … is not easy to do right. Another possibility is out-of-protocol precautions taken by healthcare workers worried about safety, but which can actually increase risks, such as wearing three pairs of surgical gloves instead of two. Removing the equipment can really be the highest risk. You have to be extremely careful and have somebody watching you to make sure you remember all the steps. We certainly share sadness and compassion for those who have lost their lives and loved ones to this terrible virus, but the health and safety of our Louisiana citizens is our top priority. There are too many unknowns at this point, and it is absurd to transport potentially hazardous Ebola waste across state lines.This situation is certainly unprecedented and we want to approach it with the utmost caution. We just can’t afford to take any risks when it comes to this deadly virus. [It was] simple airline illness. If you were on a boat for a long time and you were going up and down, those are the same symptoms that this patient would have been exhibiting … Being in a confined space, not being able to get fresh air, not being able to see outside, just feeling general motion sickness. Brown causes a fury among his fans when he comments on the Ebola outbreak. You don’t scapegoat and blame when you have a disease outbreak. We have a system failure. That is what we have to correct. I have never seen a health event threaten the very survival of societies and governments in already very poor countries. I have never seen an infectious disease contribute so strongly to potential state failure. irrational and disorganized efforts of the public to avoid infection. The outbreak spotlights the dangers of the world’s growing social and economic inequalities. The rich get the best care. The poor are left to die. 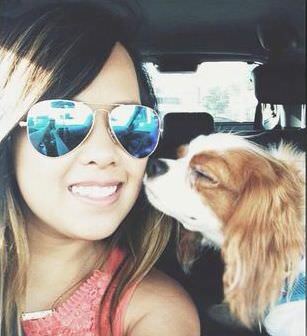 The Dallas nurse diagnosed with the virus is identified as 26-year-old Nina Pham. Her family confirm the identification. 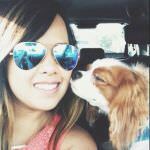 Pham graduated from Texas Christian University’s nursing program in 2010. We’re deeply concerned. Unfortunately, it is possible that in the coming days we will see additional cases of Ebola. Don’t mess with me, I have Ebola! Metro officials and the LA County sheriff’s transit authorities are reviewing surveillance tapes from inside the bus to determine the identity of the passenger, who was accompanied by a woman. CDC Director Frieden says hospitals across the U.S. must know how to handle patients who have been in affected areas, and be prepared for the possibility they have the virus. We have to rethink the way we address Ebola infection control, because even a single infection is unacceptable. I’m doing well and want to thank everyone for their kind wishes and prayers. I am blessed by the support of family and friends and am blessed to be cared for by the best team of doctors and nurses in the world. Pham is listed as “clinically stable,” according to the director of the CDC Dr. Tom Frieden. Snyderman, NBC’s Chief Medical Editor, apologizes for violating voluntary quarantine under which she and her crew are placed when her cameraman Ashoko Mukpo is diagnosed with Ebola in Africa. Snyderman and two of her crew members are allegedly seen in public picking up a take out order. While under voluntary quarantine guidelines, which called for our team to avoid public contact for 21 days, members of our group violated those guidelines and understand that our quarantine is now mandatory until 21 days have passed. We remain healthy and our temperatures are normal. As a health professional I know that we have no symptoms and pose no risk to the public, but I am deeply sorry for the concerns this episode caused. We are thrilled that Ashoka is getting better and our thoughts continue to be with the thousands affected by Ebola whose stories we all went to cover. A total of 16 Medecins sans Frontieres (MSF) doctors have contracted the virus, and nine have died. The head of Doctors Without Borders in South Africa, Sharon Ekambaram, says medical workers have received inadequate assistance from the international community. A model by Northeastern University based on flight patterns shows that the U.S. is at highest risk of more Ebola cases both without a travel reduction from west Africa and with a travel reduction of of 80%. I wish we had put a team like this on the ground the day the patient – the first patient – was diagnosed. That might have prevented this infection. But we will do that from today onward with any case anywhere in the U.S. The person, reported to be Pham’s boyfriend, is reported to be in isolation at Texas Health Presbyterian. An internal company email indicates that he works at global eye care products company Alcon in Forth Worth, Tx. WHO assistant director-general Dr. Bruce Aylward says in Geneva that the new rate confirms Ebola is ‘a high mortality disease.’ Previously, the WHO had estimated the death rate around 50%. The CDC is monitoring 11 people who had contact with Duncan and 114 people who may have had contact. None of the people are showing signs of Ebola. It says that 48 have been monitored since before Duncan was admitted to Texas Health Presbyterian, 75 are people who worked in the hospital, and one is someone who had contact with Pham. Denver-based Corgeniz develops a device called a lateral flow dipstick-type test that can identify the virus in 10 minutes. 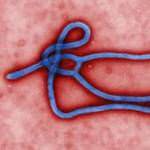 The company has received a government grant to study Ebola. The test device is already being used to detect the Lassa virus in west Africa. CEO Douglass Simpson expects the test to be available in about a year depending on the green-lighting process by the government. What if the CDC said we need to speed this process up. Could you do that? We’re in sixth gear now. We’re going as fast as we possibly can. Unfortunately, Navarro College is not accepting international students from countries with confirmed Ebola cases. As part of our new honors program, the college restructured the international department to include focused recruitment from certain countries each year. Our focus for 2014-15 is on China and Indonesia. Other countries will be identified and recruitment efforts put in place once we launch our new honors program fall 2015. We need to do that within 60 days from 1 October. If we reach these targets then we can turn this epidemic around. We either stop ebola now or we face an entirely unprecedented situation for which we do not have a plan. Unfortunately, the bodily fluid of recently passed victims continues to carry Ebola virus for up to three days following death. The body’s immune system stops fighting the disease, allowing virus to replicate unabated. We could’ve sent a more robust hospital infection control team and been more hands-on with the hospital from day one about exactly how this should be managed. They kept adding more protective equipment as the patient [Duncan] deteriorated. They had masks first, then face shields, then the positive-pressure respirator. They added a second pair of gloves. A Nurses United statement says that workers at Texas Health Presbyterian were left to train each other, and were told to call the Infectious Diseases Department about procedures, only to learn that the department had no advice. Rawlings says the outbreak may get worse before it gets better, but says the state has the capability to combat it. There are two things that I harken back to this. The only way that we are going to beat this is person by person, moment by moment, detail by detail. We have those protocols in place, the city and county, working closely with the CDC and the hospital. The second is we want to minimize rumors and maximize facts. We want to deal with facts, not fear. The global body says deaths have risen to 4,447, and there have been 8,914 cases overall. It says total cases are expected to rise above 9,000 by the end of the week. The WHO estimates figures by taking the numbers of confirmed cases and multiplying them to account for under-reporting. It multiplies figures from Guinea by 1.5, from Sierra Leone by 2 and from Liberia by 2.5. 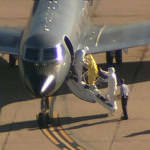 The flight landed in Dallas/Fort Worth at 8:16 p.m. local and remained overnight at the airport having completed its flying for the day at which point the aircraft received a thorough cleaning per our normal procedures which is consistent with CDC guidelines prior to returning to service the next day. It was also cleaned again in Cleveland last night. The CDC asks all 132 passengers on the flight to call 1 800-CDC INFO (1 800 232-4636). 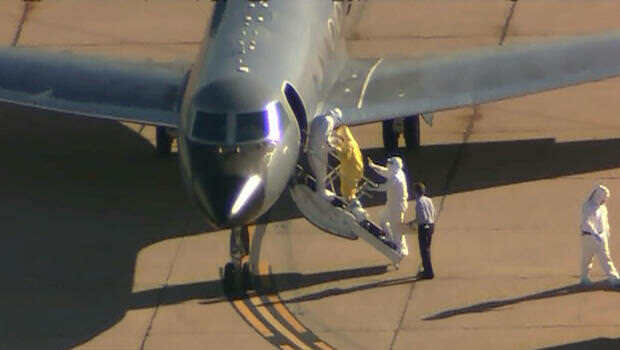 Public health professionals will begin interviewing passengers about the flight after 1 p.m. ET. Shares of the major U.S. airlines were down between 4% and 6% midday after the news broke that Vinson boarded a flight the day before her diagnosis. The President’s travel today to New Jersey and Connecticut has been postponed. Later this afternoon, the President will convene a meeting with cabinet agencies coordinating the government’s Ebola response. I don’t think that changes the level of risk of people around her. She did not vomit, she was not bleeding, so the level of risk of people around her would be extremely low. We are going to have to make sure that we do not lose sight of the importance of the international response to what is taking place. I’m confident that we can prevent a serious outbreak of the disease here in the U.S.
As a result of the virus, my condition worsened and I became critically ill soon after I arrived at Emory. Through rigorous medical treatment, skillful nursing, and the full support of a healthcare team, I am well on the way to a full recovery. [The Ebola unit is] physically separate from other patient areas and has unique equipment and infrastructure that provides a high level of clinical isolation. Dallas Fort Worth airport contractor Pablo Medina says he was threatened with being fired for being out of uniform and made to remove a mask and latex gloves. He was directing passengers at the airport exit that Vinson passed through following her flight before her diagnosis.